Our body is a temple, of which all the parts have an important role to play, to live comfortably. The loss of any body part is, of course, a big one, for anyone to adjust and adapt to a new routine of life without the lost part. But, do not worry as we would guide you all along this road of recovery and adaptation. We are the only rehabilitation clinic in Chennai, that offers the affected not only therapeutic services but a wholesome solution for them to recover physically and mentally. Upper limb amputations – Most common upper limb amputations are above elbow level and below elbow level amputation. Amputations that are less common are shoulder level, elbow level, wrist level, and finger level. Lower limb amputations – Most common lower limb amputations are toe level, above knee level and below knee level. Amputations that are less common are foot level, ankle level, knee level, and hip level. Our comprehensive, interdisciplinary team approach (i.e. care being provided by various disciplines in a coordinated fashion) with a Physician (Physiatrist), Physiotherapist, Occupational Therapist, Neuropsychologist, Nutritionist and a Rehabilitation Nurse help reduce your symptoms directly related to the illness as well as prevent medical complications that occur as a result of impaired mobility such as blood clots in the veins of the arms and legs, blood clot in the lungs, pressure ulcers, impaired wound healing, joint stiffness and muscle wasting. Not all patients will require all services and usually, a combination of these services is required for an individual patient. You will be evaluated at the initial visit to determine what services you require and a tailored treatment plan will be initiated. Patients will be evaluated by the Physician first to determine the level of the amputation and it’s impact on the patient and then formulate a treatment plan that best suits them. Depending on the patient’s symptoms, the treatment plan will include prescribing various exercises and physical modalities to reduce pain, decrease swelling, improve joint movement near the amputated site, strengthen the muscles around the amputated limb, and reduce phantom pain and phantom sensation, which will be executed by the rest of the healthcare team. The physician also recommends appropriate prosthesis and pre-prosthesis training protocol. If pain is excessive, the physician prescribes medications that can help control it on top of prescribing other treatment modalities. The Physiotherapist will train patients on various physical exercises to prevent muscle stiffness and reduce swelling in the amputated limb using manual exercises and compressive garments, then gradually focus on exercises to improve strength in the muscles around the amputation site. Meanwhile, they work on maneuvers such as desensitization techniques and mirror therapy to treat phantom sensation and phantom pain. They also use passive modalities such as transcutaneous electrical stimulation to reduce nerve pain, and neuromuscular electrical stimulation to prevent/treat muscle atrophy. 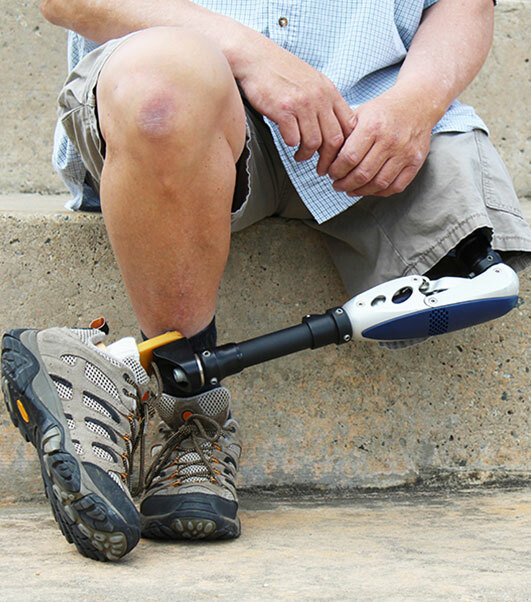 Subsequently, once the pain is controlled, the surgical wound has healed, strength has improved and residual limb swelling has subsided, prosthesis training (learning how to use a prosthesis) will be started alongside exercises to improve aerobic endurance. The Occupational therapist helps patients with upper limb amputation and prosthesis to be independent by training them on various physical activities of daily living such as moving in the bed, transferring from one place to another, eating, dressing, bathing, toileting, and driving. The final phase of treatment involves patient training for successful community integration (education, employment etc). The Neuropsychologist evaluates patients with depression and anxiety that is commonly seen after any major life-changing illness and guides them through the process of rehabilitation thereby improving their quality of life through motivation and counseling. The Rehabilitation nurse focusses on performing and teaching wound care management for patients with post-surgical wounds. Treatment duration depends on the level of amputation, pre-surgical physical and medical condition. Our goal here is to train you to use a prosthesis and be independent with walking and day to day activities and help you integrate into the community (i.e. return to work, return to driving, etc) and also focus on resolution of symptoms such as muscle weakness, nerve pain, phantom sensation, phantom pain, and decreased endurance.